Did you know that Money Magazine did a study in 2011 that showed it costs over $200,000 to raise ONE CHILD to age 18…and that doesn’t include college tuition! I emphasized the importance of building self-esteem. Picture books are a great way to connect with a young child because just about every kid loves to listen to picture books. And they are easy for the parents to read, even parents who may not be fond of reading themselves. And they are inexpensive…you can even get as many as you want for free at the library. 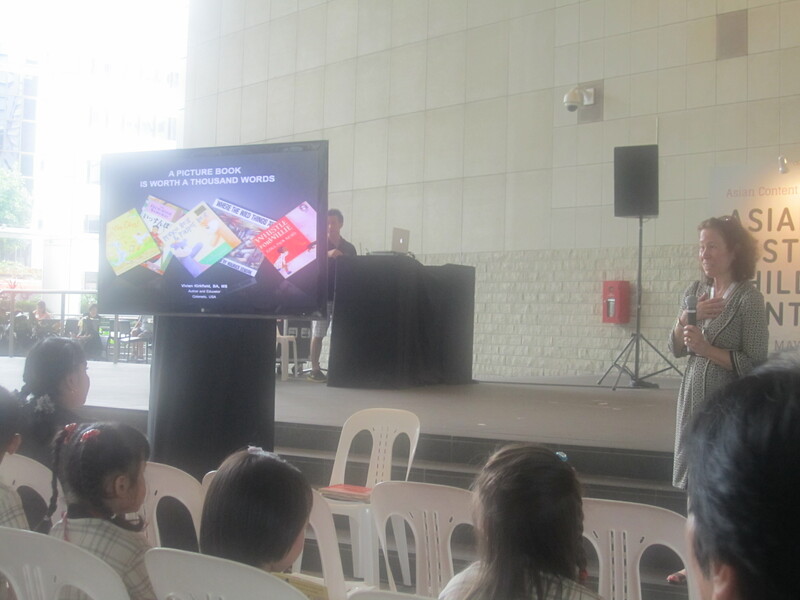 And they introduce kids to the world of art through the amazing illustrations. And they allow a child to validate his or her own life experiences and concerns as the child hears about the characters in the story who may be having similar problems. And kids who are exposed to books at a young age on a daily basis do better in school. Oh my goodness…can picture books do all of that? Yup! All you need is a young child and an adult willing to sit and read with him or her. I shared several of my favorites with the audience. What are your favorite picture books? Please share with us. Congratulations again to Tina Chen author of Mommynificent and the winner of the Kid Lit Giveaway Blog Hop prize package. I mailed it out this morning. What perfect timing for her to receive a copy of my book, Show Me How! Build Your Child’s Self-Esteem Through Reading, Crafting and Cooking, as well as a bunch of craft supplies and a copy of The Tale of Peter Rabbit. I know the book will give her lots of picture book suggestions and hundreds of activities for the long hot summer days. This entry was posted in 2013 Asian Festival of Children's Content, kids activities on a budget, Picture Books, Summer activities with kids and tagged #2013AFCC, A Picture Book is Worth a Thousand Words, Children's literature, KidLit Giveaway Blog Hop, Picture book, Singapore by viviankirkfield. Bookmark the permalink. Enjoyed what you shared in one of your talks at the festival. Great material! You are really launching yourself as an expert in this area and doing things you haven’t imagined in the last year or so. You have such insight and much to share with parents! Oh my dear Pat…you are very kind. Sometimes it is hard for me to believe that I have put myself out there in this way…out of my former comfort zone, for sure. But, when I see myself in a photo of the event, I look quite at ease. 🙂 I think, when we talk about what we are passionate about, we forget our fears. A good picture book will either make you feel (laugh, cry, etc), or think,or both. I think the best picture books are the ones your kids are to read over and over again, no matter what the books are. Kids will then retell the story on their own, page by page. They love it! I have to tell you that the books my kids enjoy the most over and over are the funny stories. If they had a great laugh the first time, they want to laugh again. And again. Even though they know what happens. I think kids truly enjoy laughing just for the opportunity of it. Oh yes, I remember now. I told you about a similar funny book about a big brother getting rid of his little brother. My kids loved that story because it was so ridiculous but at the same thing, they empathize with the big brother being annoyed. Our favorite children’s books definitely are the funniest ones. Good luck! Hey Vivian, I was going over the GIANT list of picture books I’ve read in the last six months and “I’m Not” by Pam Smallcomb stood out. It is perfect for applying the “Show Me How” technique. I could probably name a zillion picture books I love. . . 🙂 but I won’t – yet. Well done, and your picture is great. Hear the applause! I LOVE picture books. After my first two years as a kindergarten teacher, I moved ad found out I had accumulated over 300 pounds of books!! And that was years ago. I’m scared to know what I have now! I have so many favorites! Some current favorites include the Little House picture book by Renee Graff, the Little Blessings books by Dandi Daley McCall, and Max Lucado’s picture books.